To achieve this quickly I have attached a static RigidBody2D and a Collider2D (set to Trigger) to the tiles that make up the scene. The colliders are tagged appropriately based on what function they should perform. I use a Raycast2D to establish the tag of what the player is standing on and if the player is on the stairs or has walked off a cliff then the control scheme is amended to compensate. 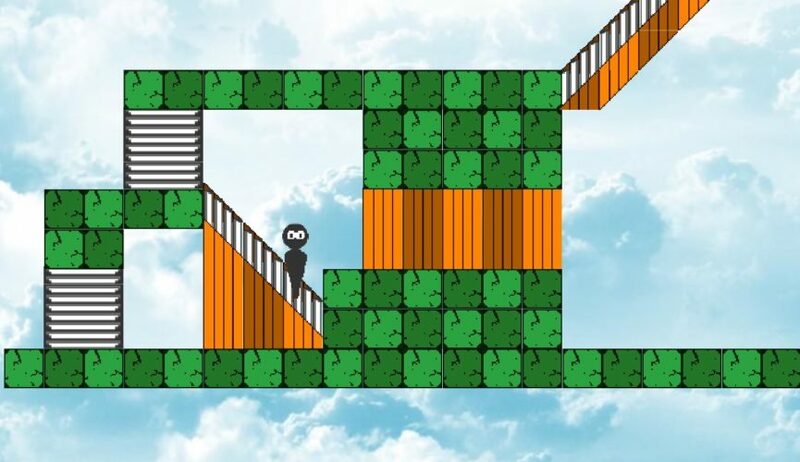 In order to get the player to ascend or descend the stairs whilst only pressing left or right, when the player is standing on the stairs and moves, the x direction of the movement is either added or subtracted to the y direction depending on the direction of the stairs. The following script is attached to the player. I also added a small 2D Circle Collider to the player, locked the z rotation and threw up a few 2D Box Colliders that were not set to triggers to prevent the player from walking off into the clouds. You could easily generate these at runtime with a script on the tiles that checked if they were touching another tile or not but in this instance i just dragged them to where I wanted them. // this is for an empty gameObject at the base of your player - make sure it is offset from your player's collider. // you could alter an int, I find this easier to read. // using the Raycast you can see what type of terrain you are traversing. // this sets up a system to adjust the players movement based on the terrain. movement = new Vector2 (moveHorizontal, -moveHorizontal + moveVertical); //This is the key line that makes the stairs work. movement = new Vector2 (moveHorizontal, moveHorizontal + moveVertical); //This is the key line that makes the stairs work.